Strad Magazine wrote: “Sebastien is a cellist to watch, because he has his own style of performance, a high level of imagination, and a combination of elegance and drive”. His first recording, with pianist Pamela Hurtado, came out in early 2014 under the Naxos label and was dedicated to the work of Hindemith. It was well received by the press. 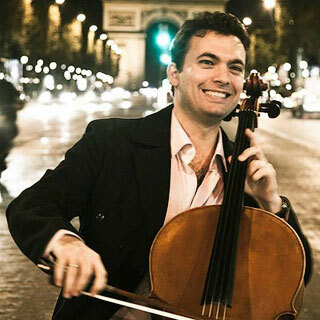 Sebastien has obtained numerous awards at several international cello competitions – First Prize in the Adam Cello Competition in New Zealand together with the First Prize for interpretation of Bach suites, Laureate at the Naumburg Foundation in New York in 2008 and in the Aldo Parisot Festival in South Korea in 2007. Sebastien is invited as soloist by some leading orchestra and also passionate about developing the repertoire of his instrument, world premiering some new cello concertos and sonatas by composers such as Thomas Schwann, Simon Sargan, Gareth Far…. in USA, Europe and New Zealand. In April 2019 he’ll record the Elgar and Farr cello concerto with NZSO released by the English Label « Rubicon classic ». His pedagogical qualities are equally appreciated. Since September 2014 Sebastien has given regular masterclasses in cello and chamber music at the Conservatoire International de Musique de Paris. He has assisted Andres Diaz at SMU in Dallas and has given masterclasses at Waikato University in New Zealand.